Fans of The Phantom Pain can now pay real-world dollars to protect their in-game assets from other players. Metal Gear Solid V: The Phantom Pain has largely been counted by the gaming public as one of 2015's most tremendous successes. Blowing gamers away with its open vision of stealth action gameplay, many fans have spent and continue to spend countless hours sneaking through its world. Not all of The Phantom Pain's features have been a hit, however. The game's multiplayer-focused Forward Operating Bases, for instance, received something of a lukewarm reception from many critics and gamers. 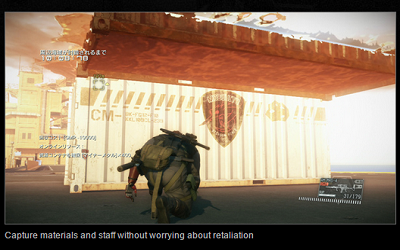 That in mind, Konami used today's launch of Metal Gear Online to bring some improvements to the FOB experience. Unfortunately for the publisher, some of the improvements have left gamers rolling their eyes. Take, for instance, a new "insurance service" that Phantom Pain players can purchase to protect the assets in their FOBs. For those not in the know, the Forward Operating Base mode involves building installations that can serve as additional resource farms and development areas to aid your efforts in the main campaign. The catch is that your FOB can be raided by other players who can steal resources and personnel for their own bases that you, in turn, can also raid. Players who spend real-world dollars on the new insurance however, will have (most of) their losses from these invasions re-imbursed. "Your FOBs are always at risk of coming under attack. Now, you can rest easy with FOB insurance (paid service)," said Konami, in its announcement. "If you sign up for insurance, then during the insurance period you will be compensated for any materials and staff lost due to rival infiltrations." Players interested in buying FOB Insurance will able to do so by purchasing and spending MB Coins. While some gamers may actually enjoy the opportunity to protect their in-game assets with this new option, we can imagine that there will be more than a few who find the whole thing kind of shady. And, honestly, it's not hard to see why. While Konami would likely argue to the contrary, it's not hard to stretch "pay us to protect your stuff" into "don't pay us and see what happens." For extra insidiousness, just imagine the whole thing being described by a clichÃ© film mobster. "Just grease our gears a little and we'll make sure nobody bothers you!" The real shame of it is that other components of the update actually do improve on the FOBs with things like new missions, improved rewards and more. Here's hoping those aren't soured by the questionable nature of the insurance policy.